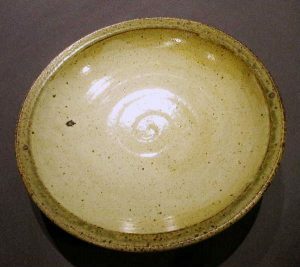 Respectful of the traditions of Hamada Shoji and Bernard Leach, my journey as a potter began in Japan where I developed a strong desire to produce functional pottery for everyday use. 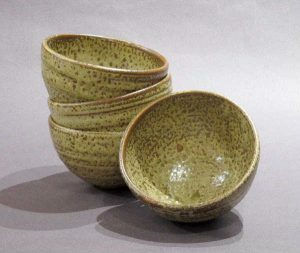 Simplicity of form and the practicality of handcrafted folk objects have always been a component in my life: in my German childhood home, in the theme of my Masters Thesis on the Japanese Folk Crafts Movement, and in my studies at the Penland School of Crafts in North Carolina. And this joyful, functional spirit still remains vibrant in my work today. 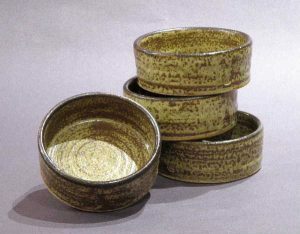 I make functional pottery that is warm and comfortable for daily use, influenced by the rich history of folk traditions. My pottery is thrown on a kick powered treadle wheel using stoneware clay which is gas reduction fired to cone 10. I am drawn to warm colored glazes like shino and ashglazes which I layer for depth, contrast and rich surfaces, often accentuated with light brush marks. Mixture of North Carolina & Tennessee clays, gas-fired stoneware. Fully Functional.